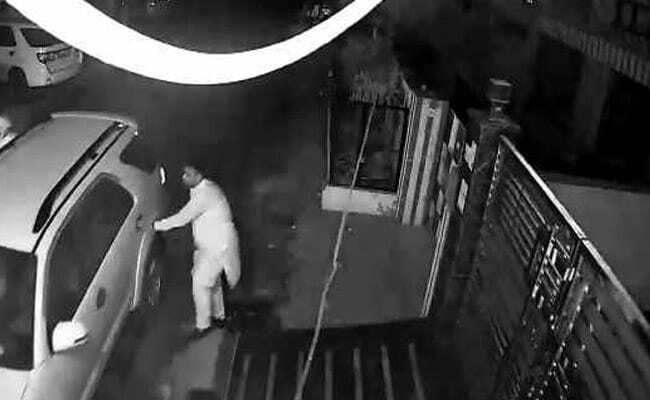 The police have acquired CCTV footage of Sourabh Madan Mithu -- a local councillor's son who organised the ill-fated Dussehra event that ended with the death of 61 spectators on a railway track in Amritsar -- escaping soon after the tragedy occurred on Friday night. The clip, a copy of which is in NDTV's possession, shows Mr Mithu leaving his home in an SUV. He and his father, Vijay Madan, have been summoned for questioning. Mr Mithu and his father remain missing over 48 hours after the incident occurred, and protesters have hit the warpath with their demands for the arrest of those responsible. Irked by their absence, a group of people threw stones at the organisers' residence yesterday night -- breaking several windows. Police brought them under control and placed the neighbourhood under guard. Although the Punjab police have registered a first information report in connection with the tragedy, they did not name anybody in the document on the grounds that the accused were yet to be identified. The case was registered under sections 304 (punishment for culpable homicide not amounting to murder), 304A (causing death by negligence) and 338 (causing grievous hurt by act endangering life or personal safety of others) of the Indian Penal Code. "It is too early to say anything about the accused, or who was responsible for the deaths on the railway track," said Amritsar station house officer Balvir Singh, adding that names will be added to the document on the basis of the ongoing investigation. It has also come to light that the organisers of the ill-fated Dussehra event in Amritsar had acquired a no-objection certificate from the police but did not bother to approach municipal authorities for their consent. "Nobody sought permission from us," Amritsar Municipal Corporation Commissioner Sonali Giri told news agency PTI. Earlier this morning, protesters clashed with the police at Jodha Fatak -- the scene of the tragedy -- after the latter came down to remove a blockade that had halted train services. No case has been filed against the driver yet, and the Railways continues to maintain that the spectators were trespassing onto the tracks.